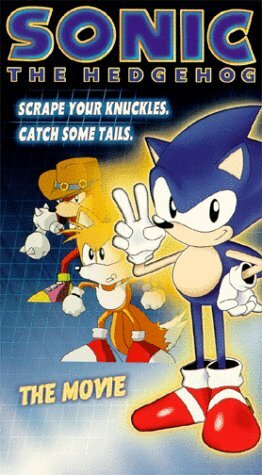 I suppose the first thing that should be noted about Sonic the Hedgehog: “the Movie” is that, in reality, it was two Japanese OVAs (Original Video Animation) that were placed back to back for the American release. I suppose it’s not a “real” movie, but the episodes transition into one-another so seamlessly that you wouldn’t be able to tell. On the Planet Freedom, home of Sonic the Hedgehog and pals, the evil Dr. Robotnik is in trouble. His headquarters of Robotropolis has been taken over by Metal Robotnik, and to make matters worse, the power-generator is overloading. If it blows up, Planet Freedom will blow up with it. By taking the President and his bratty daughter hostage, Robotnik coaxes Sonic and Tails to go to Robotropolis, defeat Metal Robotnik and stop the generator from going up in flames. However, can they really trust Robotnik? No, not really. As it’s all a ploy for the REAL plot of the movie; the creation of Metal Sonic! When this movie was released, the only animated version of Sega’s star-hedgehog that American fans had ever been introduced to were the various kid-oriented TV shows produced by DiC. Writing-quality varied between the shows, but one thing remained the same, bland and slow animation. With Studio Pierott at the helm, the animation in Sonic the Hedgehog: the Movie is quite beautiful. Maybe not theatrical-quality, but excellent all the same. One thing they managed that the American cartoons often failed at: Sonic looks like he’s going fast. Really, REALLY fast. When he first lets out that burst of super speed at the beginning of the movie, and runs along the cliffside, you know you’re in for a real visual treat. All the early characters are there: Sonic, Tails, Knuckles, Robotnik and Metal Sonic. This movie was made around the time of the Sega Genesis and Sega CD Sonic games, so this is old-school Sonic through and through. The story-telling is a fair mix of intense action and goofy anime clichés. Robotnik is nothing like the American cartoons or the Archie comics interpreted him. He’s less a dark and menacing overlord and more a one-man Team Rocket whom the heroes regard more as an annoyance than a threat. Despite this, his antics are actually quite entertaining and the zany animation just makes him fun to watch. The voice-acting in the English dub is, well, pretty bad. Sonic has an unidentifiable accent. One second he sounds British, the next he sounds Southern Redneck, then he’s a surfer dude…you can’t tell just WHAT the heck he’s supposed to sound like. I’ve even heard people say he has a South African-accent. The Hell? It’s not good if the voice actor is so bad you’re wishing Jaleel White would come back. The rest of the cast isn’t so bad. Knuckles isn’t quite as angry-sounding as I’d have liked. He works, though. Tails, on the other hand, sounds like he has a cold through the whole movie. Most-likely, the actor was just holding their nose the whole time. The BEST voice, however, would have to be Dr. Robotnik. He has a great mad scientist-thing going, and to make it even better, he’s voiced by the Hitchhiker from the original Texas Chainsaw Massacre. Awesome. The plot is nothing to take seriously, but it moves along quickly and all the scenes transition into one-another very smoothly. Metal Sonic brought to life is a beauty to the eyes, especially if you like Metal Sonic as much as I do, and his fight with Regular Sonic is a treat. Sonic the Hedgehog: the Movie is really only going to appeal to fans of the video games, and even then, only to OLDER fans of the video games, as most kids today are only acquainted with the Sonic Adventure 3D franchise and the art design and character set that goes with it. However, if you’re a fan of the old school Sonic titles, you’ll love seeing them brought to life with animation worthy of the characters. It gets a B. The movie is aimed at a specific market, and a specific age group within that market, but if you’re the target audience, this is the movie you’ve always wanted. ♥ this movie. I remember when I bought it. LOVE IT!! Never saw this movie, but as a kid I played all the original sonic games and saw the old sonic cartoons. Saw Sonic SATam religiously every saterday morning for both seasons. I kindof like the adventures of sonic in a trippy sorta silly way. I want to see it mainly for Robotnics voice. I love Texas Chainsaw Massacre (1973), especialy the Hitchhiker. It sounds cool. OMG!! !, I grew up with the old sonic games and never knew there was a movie!!! I’m gonna have to try to find where to buy it. i love this movie i’m trying to buy it! And your right i still remember how annoyed i got at tails’s voice the first few times i heard it but you get used to it eventually… and jaleel white is irreplacable so fat chance trying to knock him off the top spot! SARA IS MY HERO. I LOVE HER. I have this film on VHS, bought it on the internet. Okay considering that someone Irish did Sonic’s voice, not bad, but not brilliant either. My fave Sonic actors are Jaleel White, Ryan Drummond and Jason Griffith. THEY’RE FLIPP’N FANTASTIC!!!!!!!!!!! But Bill Wise is good, makes Knuckles sounds like a 12 year old here, I know he’s from Angel Island, but they should at least mention it in the film, they brought it in Sonic the Hedgehog Firsts and Sonic Underground. Metal Sonic’s design here, one word: AWESOME!!!!!! He’s one of my fave Sonic characters, even though he’s the bad guy but kills himself at the end, not a heartbreaker for Sonic fans, the REAL heartbreaker was in Sonic X series 2 finale when Cosmo dies, *sobs* I feel for Tails, Disney are wicked at that, but that broke the ice, truly sad. Saddest anime moment EVA! This next part doesn’t mean anything but in Sonic Heroes I’ve noticed recently that Sega and Sonic Team stole copyright from Disney mascot; Jiminy Cricket when Big the Cat from Team Rose uses a triangle dive which has Jiminy’s signature move. THEY’D BETTER NOT DO IT AGAIN OR I’LL ALERT DISNEY! AND THEY WONT BE TO HAPPY I CAN TELL YOU THAT!!!!! At least it was only for one game, and YES! I do like Jiminy Cricket! Don’t blame me he’s a pretty good character and was originally voiced by Cliff Edwards. LOVE ‘EM!!! Overall great movie. I LOVE YOU SONIC!!!!! YOU ROCK!!!!!!!!!!!!!!! I saw this movie a couple of times. I didnt like SatAM or Sonic underground but AOSTH was okay. Then I saw this and I liked how it was more of a campy comedic look instead of the serious crap like sonic x. It was quite adult and i laughed when sonic stuck his middle finger up at Robotnik. I would have liked a more advanced storyline but this is decent. Sonic’s voice is dreadful, Tails voice is funny, Knuckles voice is decent and Robotnik’s voice is superb. Great movie but I wouldnt buy it, I would just watch it on youtube. I love this movie. I always have, way before I even played the games. I agree with the grade of B.
I may be 13 but I never played a sonic game till my dad brought up that dusty “pos” genesis and loved it I have to agree could`ve gotten better voices but it was good. Hate the new shows & games! Dude, i didn’t see this at all.